Billing is done based on all non-recurring, periodic and chargeable events on an account-by-account. It is also calculated based on all the outstanding charges and available discounts and bonuses. Output from billing process is a stream of tagged bill data used for creating a bill on paper, disk, or any other media. 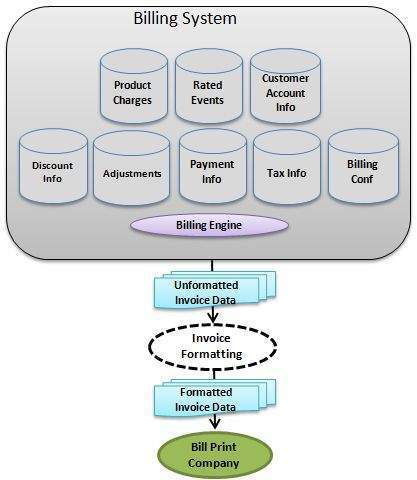 Billing Engine which is part of the Billing System will also create invoices. All the rated CDRs for the customer within the month of invoice. All types of charges (initiation, installation, periodic, suspension, termination, etc.,) applicable for the customer's products and services. If there is any refund or any other charges applicable. Total outstanding from previous bills. Total payments made by the customer in the given month. Total adjustment passed in favor of the customer or against the customer. Total discount given to the customer. Total taxes applicable on customer's usage and rental charges. Billing configuration parameter required to run the Billing Engine; for example, payment due date, etc. Above-mentioned information is just analytic and can vary from billing system to billing system and operator to operator. Billing Engine will produce raw data which will have all the information necessary for generating a final bill and this raw data will be used for generating a final invoice to be sent to the end customer. When a customer is added into the Billing System, system will assign a predefined Bill Cycle to the customer. 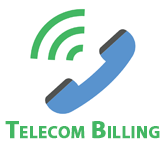 Bill cycle is a date on which Billing Engine runs and produces bills for a specific set of customers. If there are lots of customers, then they will be divided into different billing cycles. For example, a group of customers will have billing data as 1st of every month; another will have the billing date on 15th of every month. If a customer is assigned to run a bill on 1st of the month, then it will be called customer's nominal bill date. But due to various reasons, many times bill run will be delayed and actual bill gets generated on a later date, this is called as actual bill date. There can be many types of bills available for a user. Few of them may not be supported by some Billing Systems. This will be only requested as the first bill on an account and it includes product charges and adjustments, but no events. This will be produced at regular intervals and it includes all periodic charges, events, and adjustments. This is an extra bill which consists of charges due to events processed for the account since the last bill. Includes all events and adjustments, but no periodic charges. This bill will be sent when an account has been suspended and it includes all periodic charges, events and adjustments. This will be sent when an account is terminated to bill all outstanding charges that are due. Includes all periodic charges, events, and adjustments, along with any refunds; for example, the return of a deposit. This will be sent when a terminated account has receivables outstanding after the production of a final bill. Includes any post-termination events and adjustments, but no periodic charges. This is an extra bill which consists of all the adjustments in the customer's favor generated since the last bill. A summary statement will be produced for a customer-driven billing hierarchy. It will summarize all the bills produced by all accounts associated with the respective customer. Optionally, they can also concatenate all the bills into a single statement. Bills will be produced either automatically or on request from a customer. Test (what if?) billing mode − this mode is used for producing formatted test bills and at the same time leaves the database unchanged. These bills will be useful to ensure that system is working fine and test after making changes to bill templates or tariffs. When running the Billing Engine in test mode, commits will not be made to the database. Therefore, there will not be any impact on customer's profile even after running test billing for much number of times. Test bills will be usually run for a sample set of customers. If you are happy with the test bills, then you can proceed for production bills. Production (live) billing mode − this mode is used for producing normal production bills. Most of the time, this will be the default mode for the Billing Engine. Once a production bill is generated, Billing Engine will update the customer's profile in the database with total outstanding balance to be paid by the customer and next bill date, etc. Billing Engine will assign different invoice numbers to all the production bills which will help to track different payments made against the invoice. Suppressing bills for accounts with zero (zero activity bills) or very little value (small bills). A specific type of bill can also be suppressed when multiple bill types are requested/scheduled at the same time and unnecessary bills can be prevented from being sent to the customer. A small bill is a bill which falls between the ranges defined by the minimum positive bill amount and the maximum negative bill amount, exceptional bill conditions. Small valued bills will be produced and then removed from the billing process, so that they are not sent out to customers. Bill total is greater than the minimum negative bill amount. Bill total is less than the maximum positive bill amount. Bill total is less than account's credit limit multiplied by the credit limit multiplier. All the above conditions may differ from billing system to billing system and operator to operator and they are called as exceptional bills conditions. By default, all the invoices will provide a thorough summary of product and service charges along with their usage charges. But it will not provide the call details made by the customer. An itemized bill will give complete details of all the calls made by the customer but for this more number of papers should be printed. Latest trend is to send itemized bill through electronic e-mail and summary statement will be sent using a physical copy of the bill. There are Billing Systems which provide Billing Formatting utilities used for generating final formatted bills. Bill formatters will take the output data created by the Billing Engine and usually generate either Post Script file or a PDF file, which can be used by the Bill Printing Company. If Billing System is not capable of generating formatted bills, then system will generate a set of tagged files along with billing information and any external Bill Formatter can use that tagged information for generating a well-formatted invoice. Billing System will generate formatted invoice or we use an external tool for generating these formatted invoice using raw data generated by the billing engine. Finally all these invoices will be sent to the bill printing company which takes care of generating final copy of generating invoice. We will discuss all these in detail in the next chapter "Invoice Generation." In the next chapter we will explain discount process, which is actually a part of rating and billing process, but we kept it as a separate section as there are many items which need more explanation. We will discuss different types of discount hierarchies and how to apply them while rating and billing.